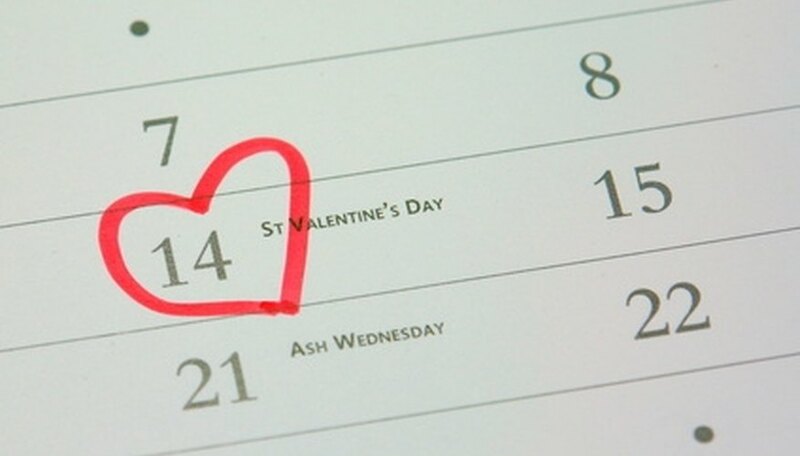 Christian couples might find it difficult to reconcile their desire to celebrate Valentine's Day with the way society has commercialized it. But by choosing meaningful activities, you can emphasize the role God plays in your relationship. You can rejoice in the love between you and your partner and thank God for helping you find someone special. Many couples splurge on dinner at a romantic restaurant for a Valentine's Day date. Eating someplace special makes for a memorable night, but if restaurants are out of your budget, cook a fancy meal at home. Preparing food for each other is a loving gesture, and dinner will taste so much better knowing the love that was used to make it. Discuss your favorite dishes and create a menu--don't forget about dessert. Shop for groceries together and when it's time to cook, listen to classical music and enjoy the time in the kitchen. As you finish cooking dinner, change into nice clothes, dim the lights and set the table with candles and flowers to complete the experience. Most Christian couples make Bible study part of their daily lives, but some passages speak to certain seasons and holidays. The Song of Solomon is particularly appropriate for Valentine's Day because it recounts the tale of a romantic relationship. Spread a blanket on the floor, pour some wine or enjoy a cup of cocoa and cozy up to the fireplace as you take turns reading passages. Corinthians and Song of Songs also have many romantic verses. Married couples may choose to re-read the Bible passages they chose for their wedding ceremony. Delight in the beauty of winter by spending time outside with your loved one. Bundle up and head to a local pond or rink for an afternoon of ice skating. It doesn't matter if you're an experienced skater, or if you've never even been on the ice. You and your partner can support each other and keep each other from slipping. Later, you can discuss how this is a metaphor for a successful relationship. Wintertime hikes showcase the beauty that God created. Leisurely stroll through a local park while holding hands. Share the experience of trying something for the first time. Perhaps you've always wanted to learn ballroom dancing, but you aren't sure you're coordinated. Maybe your partner wants to try paintball, but feels silly. Step out of your comfort zones together and give a new activity a shot. By encouraging each other to pursue a goal, you'll strengthen your relationship and have fun in the process. Bancroft, Carol. "Free Romantic Christian Valentine Ideas." Dating Tips - Match.com, https://datingtips.match.com/romantic-christian-valentine-ideas-6921832.html. Accessed 21 April 2019.